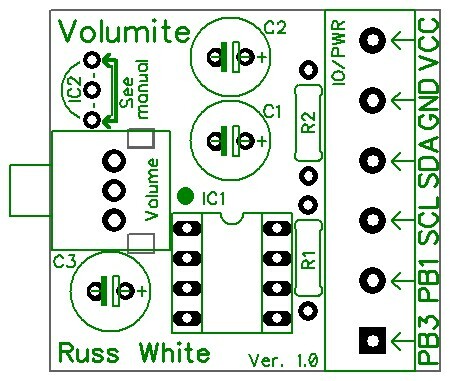 The Volumite is a simple Volume control module for controlling devices with either an I2S or SPI serial interface. It also exposes two additional I/O ports which can be used for additional functions. Below you will find firmware options for Volume control of the Buffalo and Opus DACs. 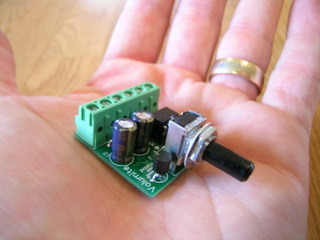 When used with the Buffalo**, the Volumite attaches via four wires to the I2C header on the DAC module. The Buffalo retains its configuration functionality using the onboard dip switches. When used with the Opus, the Volumite attaches to the SPI header on the DAC module. In order to use the WM8740/1's digital volume, the chip must be placed in software mode, which means some of the onboard switches will not longer function. Because of this, we have a few versions of the firmware to allow for various configurations. Note: The Volumite base kit does not include a microcontroller with firmware, and will not function. You must either select one of the available firmware versions, or provide your own programmed Atmel ATtiny85 microcontroller. Note: The Buffalo-III and Buffalo-IIISE DACs have Volumite functionality built in, so Volumite will not work with them. Alternate firmware chip for B-II users experiencing lock issues with some particular I2S sources. Alternate firmware chip for B-II users using Volumite and experiencing lock issues with some particular I2S sources.